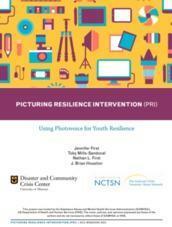 The Picturing Resilience Intervention (PRI) is a group intervention designed to promote resilience and coping skills among youth following a disaster, community crisis, or other challenges resulting from the usual stresses of daily life. PRI blends Photovoice, a community participatory action method, with additional skill-building activities in order to enhance problem solving, coping, and self-expression in participating youth. Participants are provided with cameras and instructions on basic photography and camera use. Then, five group sessions are conducted. Session topics include: Safety, challenges and stressors, strengths, coping skills, and resilience. During each session, a main topic is discussed and then followed by a skill-enhancing group activity and a photography homework activity. At the end of the group sessions, youth participants display their photography with accompanying written narratives in a final PRI exhibit. The activity should be facilitated by two mental health professionals, teachers, or adult professionals with experience working with youth. A common training approach to facilitating PRI is for providers to read the manual and then obtain ongoing support and consultation from PRI specialists as needed.